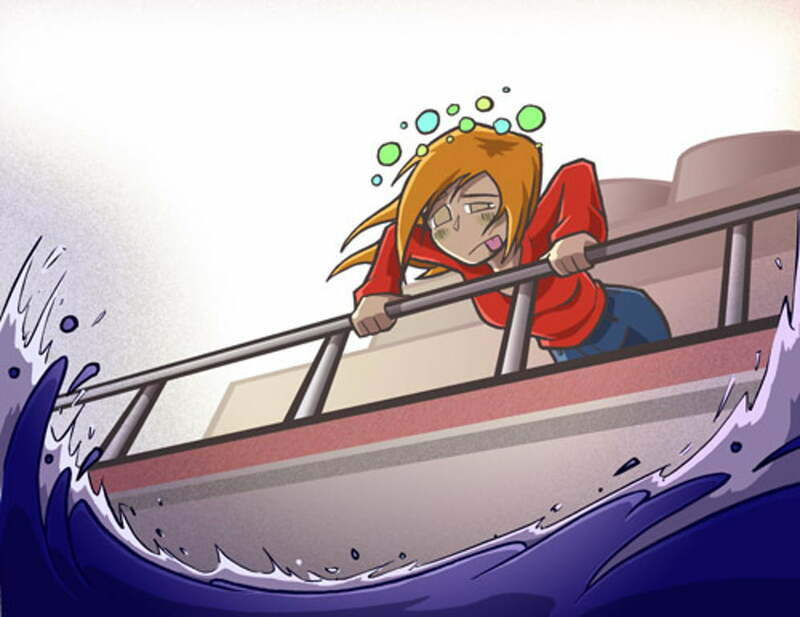 Sea Sickness caused by boat motion can be a serious problem for sailors. Not only does the sick person feel terrible and become incapacitated but the dehydration that may result from repeated vomiting can become a medical issue. Therefore it’s important to know how to prevent seasickness. About 90% of people will experience seasickness or motion sickness at some point in their lives. If you’re new to sailing or have ever experienced nausea or dizziness on a boat, it’s worthwhile to take steps early to prevent seasickness. Once seasickness occurs, it’s too late to do much more than cope with it as best you can. Even with many medical studies and hundreds of years of experimenting with how to prevent seasickness, no one method or medication has been developed that works for everyone. But various methods do work for different people, so it’s mostly an issue of taking the problem seriously and trying to determine what will work best for you. Please note: The information below is provided for information purposes only and you should refer to your medical practitioner before following any of these remedies. Nonprescription medications available from pharmacies are essentially antihistamines. Their primary side effect is drowsiness, possibly even in their “non-drowsy” versions. These medications must be started 1 to 2 hours before getting on the boat. These work for many people. Prescription medications are generally considered the most powerful and most effective anti-seasickness medication. You will need a prescription from your doctor. Side effects are also more significant, including vision disturbances that may make it difficult or impossible to read – a potential problem for anyone who must be able to read a chart or plotter. Talk to your doctor if you have experienced seasickness in the past and have found other remedies ineffective. Note: if you have a health condition or are taking other medications, talk to your doctor before starting any new medication, to ensure the drugs do not produce a negative interaction. Ginger in any form has been widely praised as a preventive remedy. Sailors chew crystallized ginger, nibble on ginger snaps, drink ginger ale or ginger tea, and swallow ginger capsules. Although medical research does not strongly support the use of ginger, many swear by its effectiveness. Soft drinks such as Coke and Pepsi are also said by some to help prevent feelings of queasiness and mild seasickness. Food and drink to avoid include alcohol, heavy and greasy foods, and strong spices. Plain crackers may be best if you begin to feel queasy. Wristbands, such as Sea-Bands, are wristbands with a small plastic bubble that puts pressure on a certain point at the wrist, said to be an acupressure point to prevent seasickness. Some have found these very effective. Electric wristbands, such as the adjustable Relief Band, are similar but are said to work by providing a small electrical stimulation to the wrist. Stay on deck. Keep in the fresh air and watch the horizon. Usually, the worst possible thing is to go below ships. Then your brain can’t reconcile what your inner ear is feeling (motion) with what you’re seeing (lack of motion below). Minimize motion by taking a position amidships where the movements of roll, pitch, and yaw are less than at the bow, stern, or rails. Avoid reading or other near-focus observation. Similarly, avoid staring too long through binoculars. Concentrate on something else. Take the helm or engage in some boat work, rather than dwelling on thoughts of starting to feel queasy. If you do feel sick, take a position near the rail on the leeward (downwind) side of the boat. Vomiting may occur suddenly, and no one wants it in the boat (where its smell may make you or others feel sicker). Once sick, it may help to lie on your back with your eyes closed, still preferably out in the fresh air. From that point, it’s often a matter of waiting it out. In most cases, you should begin the remedy well before beginning to experience any signs or symptoms of seasickness. Usually, that means before getting on the boat. But if you start out on a calm day and boat motion later starts to pick up, it’s better late than never. Seasickness often begins with general feelings of drowsiness – the first sign may be yawning. Don’t wait!